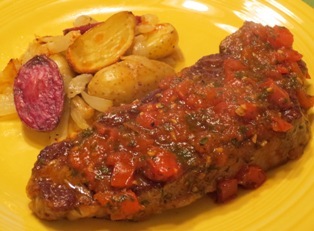 Steak Pizzaiola is a Neapolitan dish. In Naples, some of the most popular toppings for a pizza are simply chopped fresh tomatoes, chopped garlic, and oregano. These same ingredients are then used to make a sauce for simmering steaks, which is how the dish got its name. If you use canned tomatoes, add about 2 cups and include some of the juice from the can; omit the additional tomato juice or water. Pat the steak s dry; season them with salt and pepper. Heat the oil in a large skillet over medium-high heat. Add the steaks. Cook until browned on both sides, about 3 minutes per side. Add the remaining ingredients to the skillet; cover partially. Cook, turning the steaks occasionally, for about 30 minutes. The steaks should be tender and the sauce slightly thickened. Serve the steaks topped with some of the sauce. Season the roast with salt and pepper. Coat with flour, shaking off excess. Put 2 tablespoons of olive oil in a large saucepan (Dutch oven) over medium heat. Add the roast and brown on all sides. Transfer the roast to a plate and set aside. Add the remaining tablespoon of oil to the saucepan. Saute the onions, bay leaves, garlic, red pepper flakes, thyme and 1 teaspoon of salt. Cook, stirring occasionally, for 5 minutes or until the onions just begin to brown. Add the white wine and Marsala. Increase the heat to high and bring to a boil. Cook, stirring occasionally, for 6 to 8 minutes and reduce by half. Return the roast to the saucepan. Add enough chicken broth to reach halfway up the side of the roast and bring to a boil. Reduce the heat to low, cover, and simmer for 2 hours. Turn the meat a few times during the 2 hours. Remove the meat to a plate, cover with foil, and set aside. In a large skillet melt the butter over medium-high heat. Add the mushrooms and saute until they begin to brown. Add the carrots and celery and saute for 5 minutes, stirring occasionally. Transfer the vegetables to the gravy in the saucepan. Bring the gravy to a simmer over medium heat. Cook for 30 minutes, uncovered, until the vegetables are tender and the gravy has thickened. If the gravy is reducing too much during this time, cover the saucepan. Return the meat to the saucepan and cook just long enough to reheat the meat. Serving Suggestion: Serve with wide pasta, such as pappardelle, or mashed potatoes. Heat 3 tablespoons of oil in a large saucepan over medium heat. Season the beef with salt and pepper. Add the beef to the skillet and brown on all sides. Remove to a dish and set aside. Add the remaining oil to the saucepan.Add the onions, garlic, and red pepper flakes. Cook over medium heat until the onions are soft. Stir in the tomato paste and cook 1 minute. Pour in the beef broth, tomatoes, and red wine. Return the beef to the saucepan. Add the rosemary and sage. Simmer over low heat, covered, for 1-1/2 to 2 hours. Beef is done it is very tender and the sauce is thickened. Season with salt and pepper. Transfer to a serving dish and serve. 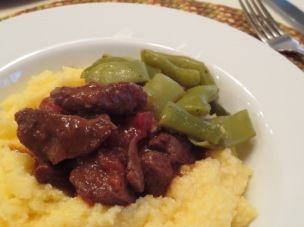 Serving Suggestion: Serve with soft polenta and Italian green beans. I recommend cooking the short ribs the day before you plan to serve them. Short ribs release a large amount of fat during cooking which you should skim off before serving. If you refrigerate the sauce overnight, the fat will rise to the top and it is easier to remove. Season the short ribs with salt and pepper. Heat the oil in a large Dutch oven over medium high heat. Add the short ribs and saute for 7 to 8 minutes, or until well browned on all sides. Remove the ribs and set them aside on a plate. Add the onion and garlic; saute for about 2 minutes or until the onions are tender. Add the tomato puree, wine, mustard, and beef broth; bring to a boil. Add the short ribs back to the Dutch oven; remove from the heat. Cover the pot and place in the oven. Roast for 2 to 2-1/2 hours or until the meat is fork tender. Check the meat about half way through and give it a stir. Remove the meat from the sauce and put in a plate. Skim the fat off the sauce or transfer to a container and refrigerate overnight. The next day simply skim off the fat that has congealed on top of the sauce. Bring the sauce to a simmer in a large saucepan. Remove the meat from the bones and shred the meat into small pieces. Stir the shredded meat back into the sauce. Drain and place the pasta in a large serving bowl. 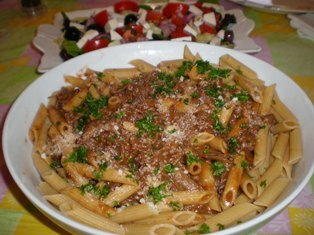 Using a slotted spoon, remove the meat from the sauce and add it to the pasta. Add additional sauce to the pasta, as desired; gently toss the pasta and sauce. Sprinkle the pasta with Parmesan and parsley and serve. Cook the steaks about 5 minutes per side for medium-rare. Add water to the skillet and scrape up the brown bits from the bottom. Add garlic and oregano; cook for 1 minute. Add the tomatoes and cook for 3 more minutes. Add the artichokes and olives; cook for 2 minutes. It's tempting to add just one more piece of meat to the skillet when browning, but don't do it, because the meat will never get the brown crust you want. Instead, cook in batches, and don't rush the process. Dark caramelization yields complex flavor. The same is true when roasting vegetables. And for the most evenly baked cookies and cakes, give the pans some space, with two at the most in the oven at the same time. This popular new steak is catching on with steak lovers everywhere. Flat Iron Steak is extra tender and juicy with a robust, beef flavor that's delicious grilled, broiled, or pan fried. Big on flavor, yet completely trimmed, this trendy steak is one you have to try! Juicy, tender Omaha Steaks Filet Mignon wrapped in a savory strip of bacon. Removable metal skewers hold bacon in place during cooking. 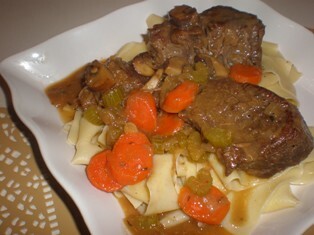 Generous pieces of tender Omaha Steaks sirloin beef tips in a delicious mushroom and wine sauce. Great for when you're short on time; just heat in oven or microwave and enjoy. Do your hands need a break from holding your tablet? The Anker Multi-Angle Stand easily solves the problem, enabling you to effortlessly read, watch movies, record video and much more. The stand adjusts to virtually any angle; all it takes is the press of a button. The shelf design allows for viewing in both portrait and landscape positions. Great for grilling shellfish, vegetables, small bites and more. This lightweight ceramic grill grid offers the performance of high-heat cooking without the weight or added maintenance of cast iron. Eco-friendly ceramic is fireproof and heat resistant up to 700°F.